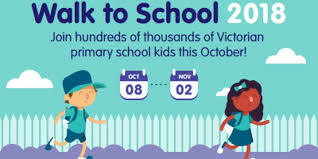 A reminder that tomorrow we will be hosting a healthy schoolyard walk (a 20 minute walk around the basketball courts), followed by a healthy fruit breakfast provided by the Darebin City Council. The breakfast has been provided as part of our involvement with the Darebin City Council’s Walk to School October program. A reminder that all students are to wear their PE uniform.